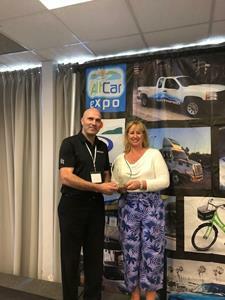 Electra Meccanica CEO, Jerry Kroll, accepting recognition from Canadian Consul and Sr. Trade Commissioner in LA, Patricia Elliott, at the debut of the company's new single-passenger EV, the SOLO, at the AltCar Expo in Santa Monica, CA. LOS ANGELES, Oct. 15, 2018 (GLOBE NEWSWIRE) -- Electra Meccanica Vehicles Corp. (NASDAQ: SOLO) (“Electra Meccanica” or the “Company”), a designer and manufacturer of electric vehicles debuted its new EV single passenger car, the SOLO, to an enthusiastic Southern California audience on Friday, Oct. 12, and presented their first US owner with his new vehicle on Saturday (13th). The gathering of alt-energy thought leaders this past weekend in Santa Monica, CA, included civic dignitaries, educators, traffic and transportation officials, fleet managers, the media and thousands of consumers at the two-day event. Anthony Luzi, Electra Meccanica’s Director of U.S. Operations, was featured on two panels. The first on Friday, moderated by motor critic, Sue Carpenter, was titled, “How Committed are OEMs to the EV movement”. This was followed by Saturday’s panel, moderated by Santa Monica Daily Press Editor, Matt Hall, focusing on “The State of the Industry for Single Passenger Transit”. As part of the event hundreds of attendees completed SOLO test-drive sign-up cards, while the Company received more than a dozen deposits on the SOLO and the Tofino. Electra Meccanica is opening their first U.S. dealership at 11685 Ventura Blvd., Studio City, CA 91604.